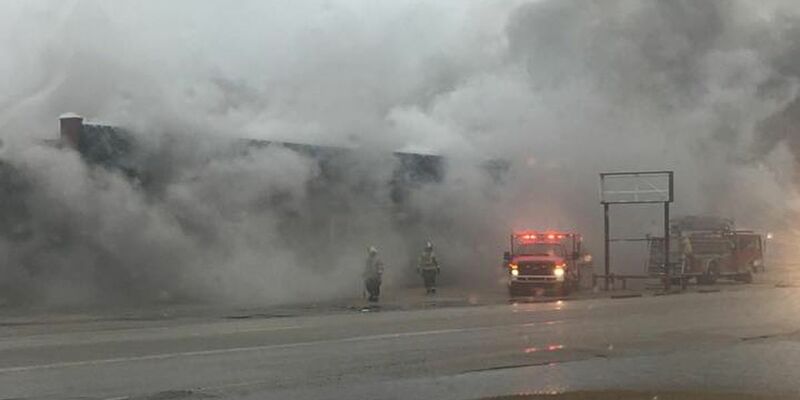 BLYTHEVILLE, AR (KAIT) - Blytheville Fire crews battled a warehouse fire Saturday morning. According to Fire Chief Mike Carney, firefighters were called to the former Sanders Supply building on 6th Street and Hudson around 9 a.m.
Crews arrived and saw heavy smoke and flames coming from the roof. Carney said they begin to fight the fire from the inside, but the roof collapsed shortly after crews arrived. Firefighters spent just over an hour to contain the fire and crews stayed on scene monitoring hot spots until around 1 p.m.
Armorel, Dell, and Gosnell Fire Departments helped fight the fire. Carney said the building has been vacant for years and the cause of the blaze remains under investigation.